No-kill animal shelters and PETA: What is the most humane way to treat stray cats and dogs. Are No-Kill Shelters Good for Cats and Dogs? The animal welfare world’s vicious fight about what it means to be humane. 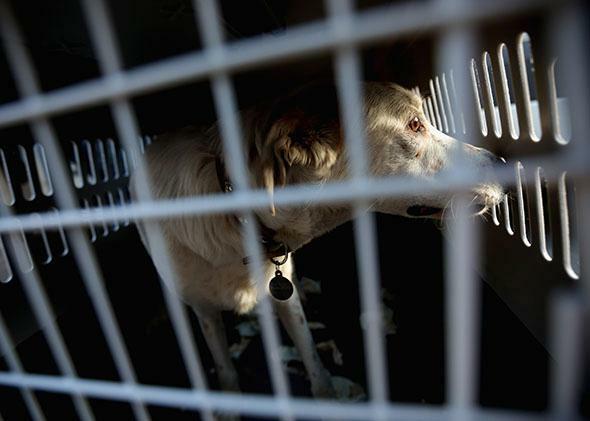 A stray dog from Sochi, Russia, waits in its travel crate after arriving at the Washington Animal Rescue League on March 27, 2014, in D.C.
New York City developed a grisly solution to its stray dog problem in the 1870s: It locked dozens of dogs at a time inside an enormous iron cage and submerged them in the East River. Capture, drown, and repeat, until the population was under control. No one objected. Stray dogs were dangerous and spread disease. The idea of a “no-kill” shelter—a place to house every single stray until it was adopted or died naturally—would have been incomprehensible. Today, 70 percent of American pet owners believe unwanted dogs, unless they are incurably ill or irredeemably aggressive, should be cared for indefinitely. This reversal in public opinion seems like a major success for animals, but it’s not that simple. The no-kill shelter movement splits the animal rights community. Advocates believe it is an important step toward recognizing the moral status of nonhuman animals. Critics, including People for the Ethical Treatment of Animals, say that no-kill shelters are a façade for profiteers who turn away the vast majority of homeless animals and keep the rest in dismal conditions. If you care about animal welfare, the dispute is ludicrously thorny. In some ways, the history of animal shelters in the United States is embarrassing. Animal control was little more than a hostage-taking operation when the country was young. Pounds held wandering animals for ransom from their owners. Unclaimed cows and pigs went to the highest bidder. Since dogs had little economic value, the pound-master typically executed them using whatever means he found convenient. As the stray dog population expanded, so did the executioner’s imagination. Mass canine drownings and other horrors prompted societies for the prevention of cruelty to animals to open their own shelters, beginning with Philadelphia’s City Refuge for Lost and Suffering Animals in 1874. They favored adoption, but they were perfectly willing to put down unwanted strays en masse. The gas chambers at 19th-century animal shelters eventually killed even more efficiently than New York’s iron cage. The animal shelter situation has historically been a bit chaotic. There are municipal shelters, typically funded by taxpayers; shelters run by humane societies, usually funded by donors; and quite a few independent ones that are started by people with big backyards or space in their basements. Until recently, almost all of them would kill to make room for newer and more adoptable animals. In the late 1980s, activist Ed Duvin wrote the essay “In the Name of Mercy,” making no-kill an ideal for animal lovers. Some shelters have jumped on the bandwagon. Most, however—including many of the municipal shelters that are obliged by law to accept all animals—continue to euthanize 50 percent or more of the animals they take in. There are few guidelines governing when and whether to kill. It is typically a decision made on a case-by-case basis by veterinarians and shelter managers. No-kill is an appealing idea. But before condemning U.S. shelter managers as barbarians, look at a country like India, which prohibits the killing of unwanted dogs. The country’s 25 million stray dogs live in deplorable conditions—emaciated, diseased, surviving on trash, and in constant conflict with humans. The country suffers 20,000 human deaths from rabies annually, which represents more than 35 percent of the global total. Contrast this with the situation in the United States. Stray dogs are incredibly rare, and one or two Americans die annually from rabies, invariably transmitted by a wild animal. The debate between no-kill advocates and traditionalists comes down to this question: What kind of life can we give animals that are surrendered to shelters? And would that life be better than a quick death? 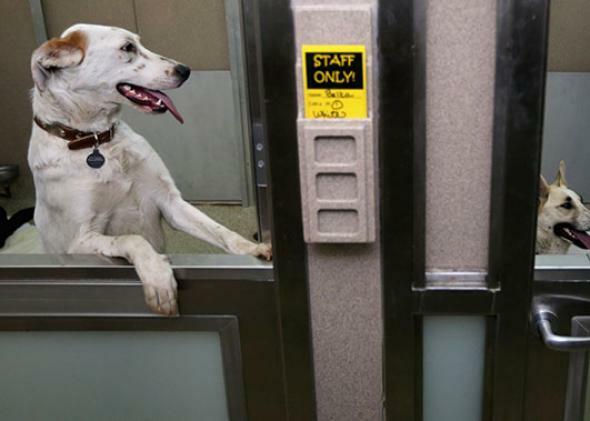 Two stray dogs from Sochi, Russia, get acclimated to the “doggie den” after arriving at the Washington Animal Rescue League shelter on March 27, 2014. Nathan Winograd, director of the No Kill Advocacy Center, believes we can provide a good home to every shelter animal. Approximately 4 million cats and dogs are euthanized in shelters each year. One million of those animals—including feral cats, terminally ill animals, and vicious dogs—are unadoptable. That leaves 3 million animals in need of good homes. Based on a variety of polling data, Winograd estimates that between 9 million and 23 million families look for a new pet each year. Since three-quarters of them have not decided where to get their new companion animal, no-kill advocates would have to convince just half of undecideds, and possibly significantly fewer, to adopt from a shelter rather than buy from a breeder or pet store. That goal is achievable, according to no-kill advocates, if we simply improve shelter management. “Most of the people running animal shelters have the creativity and imagination of rocks,” says Gary Francione, a law professor at Rutgers University and co-author of the book Eat Like You Care: An Examination of the Morality of Eating Animals. Winograd says cities like Reno, Nevada, prove that no-kill sheltering is possible. When the two largest shelters went no-kill, they launched a marketing effort to increase adoption rates. Local veterinarians and other businesses offered incentives to adopters. Foster homes cared for animals waiting for permanent families. The shelters’ volunteer staff increased 40-fold. Private donations expanded and euthanasia costs dropped, so the changes cost the local government nothing. The kill rate at shelters dipped below 10 percent, approximately one-fifth the national average. PETA says that cities like Reno aren’t doing as well as Winograd claims. Nachminovitch points out that since Reno went no-kill, the intake rate at county shelters has steadily increased. That means their outreach efforts are failing to control unintended breeding, and some of the adopted animals are bouncing back to the shelters. There are currently several Reno-area posters on Craigslist looking to offload animals adopted from the local shelter. PETA investigations also reveal that a large number of no-kill shelters fail to move their animals into homes. This creates a logjam. The organization has posted video of dozens of no-kill shelters turning away sick and injured animals because of months-long waiting lists. Some charge $100 for admission, even though owners often surrender animals because they can’t afford to care for them. These organizations can only call themselves no-kill, PETA says, because they have the luxury of sending overflow animals to other shelters with the gumption to make tough decisions or the legal obligation to take all comers. There is such animosity between the no-kill movement and PETA because both sides are so passionate about this issue. No-kill advocates accuse PETA of taking a 19th-century view of animal rights. Francione writes that early animal rights advocates like Jeremy Bentham focused solely on suffering, not on the animal’s inherent right to life. In his view, PETA’s willingness to kill to alleviate overcrowding perpetuates that idea. Behind the vitriol, the two sides agree on many things. Shelters should have partnerships with rescue groups and veterinarians. They should be staffed with caring volunteers who look for good homes, not just any home. They should offer animals exercise and attention. They should actively push spay and neuter programs. If you’re looking for a shelter to support, these are the things you should care about. They are what make the difference between a good shelter and a bad shelter. You may be able to avoid the difficult philosophical question of whether euthanizing shelter animals is humane. No-kill is a truly admirable goal, but it only works when a community is willing to back it with time and money, and to open their homes to unwanted animals. If that doesn’t happen, no-kill can become a very dangerous slogan. If a shelter can’t guarantee a good home to an animal, is it right to keep it alive in a cage, or bouncing back and forth between the shelter and a bad home? Or is it better to give the animal a quick death? I suppose only a dog could answer that question.